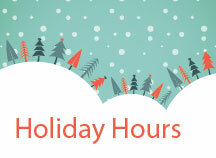 Check out our holiday hours at New Braunfels Feed this year. It’s been a great year at New Braunfels Feed and we wish all of our customers a Merry Christmas and Happy New Year! Watch our Facebook page for the latest updates. New Year’s Eve – Monday, December 31 -Open at 7:30 a.m. – 5:00 p.m.
New Year’s Day – Tuesday, January 1 -Open at 7:30 a.m. – 5:00 p.m.
Shop local this season and support small businesses. Stop in for all your feed and supply needs today and we appreciate you making New Braunfels Feed and Supply your feed store! This entry was posted on Tuesday, November 27th, 2018 at 8:10 pm	and is filed under Events, News & Updates. You can follow any responses to this entry through the RSS 2.0 feed. Both comments and pings are currently closed.